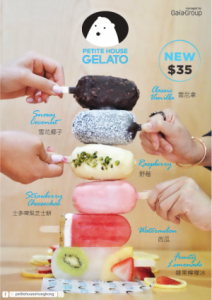 Petite House’s is famous for their freshly churned gelato, but their popsicles are just as irresistible! All popsicles are brand new this summer and there are 6 delicious flavors all at $35 HKD. We have a Classic Vanilla gelato popsicle with a crispy chocolate coating, a Snowy Coconut flavor on top of a chocolate coated vanilla ice cream, a Raspberry gelato ice cream with white chocolate coating and bits of pistachio sprinkled on top, a delicious Strawberry Cheesecake gelato ice cream popsicle, a refreshing Watermelon flavor, and lastly a Fruity Lemonade flavor with REAL fruits inside. Make a quick break at Petite House after shopping to try our new summer popsicles, they are perfect on a hot summer day and cures your sweet tooth! Make sure you try all the new delicious flavors and check out our 5 BRAND NEW summer gelato flavors as well!